Drug use and addiction aren’t the same thing. Many people use drugs recreationally. Although this habit may not be desirable or healthy, it doesn’t always require therapy. Identifying addiction is important because it helps you understand your treatment options. According to a 2013 National Institute on Drug Abuse survey, almost 10 percent of the population had used an illicit substance in previous months. A 2015 survey found that about 86 percent of American adults had consumed alcohol at some time in their lives. These statistics don’t indicate that these individuals have a drug addiction. Some people simply drink alcohol in moderation or use prescription drugs to treat medical conditions. 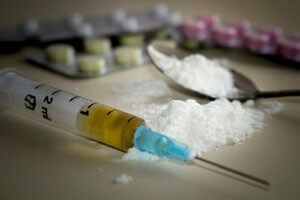 However, using drugs at a young age makes developing an addiction more likely. People react to drugs differently. For example, experts believe that some individuals are more prone to addiction than others. In some cases, drug use can turn into uncontrollable substance abuse. Above all, addiction is not an indication of a weakness. It’s a complex interplay between the brain and the body. Drugs can change the way you think and behave, so you’re unable to control your cravings without professional help. Most drugs make you feel good. Generally, that’s the reason people use them to begin with. They produce a high that activates the reward centers of your brain. Because the chemicals produce pleasurable sensations, your brain tells you to continue taking them. If you continue using a substance, your body acclimates to its effects. You may need to take more to feel the same rewarding sensations. Eventually, you may not feel good at all when using. By that time, your body may forget how to produce natural mood-enhancing chemicals. You feel worse than you did before you began abusing drugs, and you’re not sure how to feel better. Thus you resort to taking the drug again to escape from your painful, depressed state. This is a sign of dependence. Now, you need the drug to feel normal. If you have a substance addiction, you may devote large amounts of time to obtaining your drug of choice even though it’s negatively impacting your life. Using drugs causes detrimental side effects. Eventually, many drugs stop producing a pleasurable high. Taking them might make you feel terrible. However, not taking them feels even worse. When people use drugs, their behavior usually changes when they’re feeling the chemical’s effects. They might become more or less sociable and talkative. They may seem more energetic or drowsy. You might notice changes in their facial expressions or the way that they move their eyes. Some people experience sleeplessness, shakiness, or lethargy when using as well. If an individual has an addiction, their behavior usually changes for an extended period of time. For example, those with an addiction might focus their daily activities on obtaining drugs. Additionally, they may act out of character when hit with powerful cravings. They may also lose interest in work, school, or social activities. In many cases, people with drug addictions start experiencing physical and mental complications even when they aren’t high. Addiction is a disease. Therefore, it’s a medical condition that requires treatment. A high-quality rehab center provides comprehensive programs that help people stop using drugs, understand their addictions, and combat the desire to use. You don’t have to have a life-threatening addiction to seek treatment. If drug use is controlling your life, call 1st Step Behavioral Health at 866-319-6126 to begin healing.